16 pp, red paper covers. An advise book for young boys hoping to succeed in business. The book is broken up into categories: One thing at a time, the way to win (all on one page), the things explained, and hard to understand. On the first page of the book, it describes 'the chance' each boy takes in business. It states "a boy can do some things better than a man. These are given to boys to do; but boys who do them well are scarce.... A girl is a boy in business." The interior cover page lists the author as "by a man who was once a boy himself and knows what boys are good for and what is good for them", however the author, J E Powers, appears under the copyright notice. Title Cover: How a Boy Had Better Behave in Business and What is Going to Come of It. Measures 3 3/4" x 2 1/2".. Minor edge wear. Toning due to age. A single side license, folded into quarters. This license gives the owner the right to make and sell Superlative Honey, patented by Merano Butterfield. It also provides the recipe for the honey. This license is owned by Eleanor Ford of Iroquois, IL. It is dated September 16, 1859 and is signed by Butterfield. Measures 8" x3" (folded), 12 1/2" x 8" (unfolded). Missing a large section at the bottom. Please see picture. Minor faded penciling. 54 pages, Green cloth over board. This item is two books in one: Preston's Complete Time Table, and Preston's Tables of Interest. There were bound together by the publisher. The first is a perpetual calendar which allows the reader to figure out the "number of days from any dat in any given month to any date in any other given month. The second book allows the reader to figure out the "interest on any sum from one dollar to five hundred dollars" when that interest is computed at 6 percent. Measures 10 1/2" x 8". 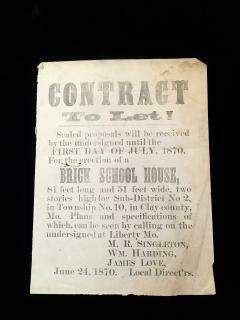 A 12 1/2" x 9 1/2" broadside - Contract to Let - Sealed proposals will be received by the undersigned until the First Day of July, 1870 for the erection of a BRICK SCHOOL House, 81 feet long and 51 feet wide, two stories high for Sub-District No 2, in Township No. 10, in Clay county, MO. Plans and specifications of which, can be seen by calling on the undersigned at Liberty MO. M. R. Singleton, Wm. Harding, James Love - Local Direct'rs..
An album of 3 1/2" x 5 1/2" photographs (real photo postcard stock) to promote Kolmar Laboratories, the largest contract manufacturer of color cosmetics in the world in it's day. Contains 12 photos including women inspecting and packing Serrate Puffs, an assembly line, scientific method of measuring shades of rouge, lipstick and powder in in "dominant Hue", a research and control laboratory, the lipstick moulding department, An additional loose photo of Newark NJ plant. . Company was founded in 1921 by Mr. Lessing L. Kole in a small store in Milwaukee WI with Dr. Frederick Marsek, who had been the Chief Chemist for Palmolive in Milwaukee. The name was derived from their names. The company continued to grow and is still the largest contract manufacturer of color cosmetics in the world.
. Joseph Vera, a Portuguese immigrant became a prominent business man in New Bedford, MA. In addition to owning a men's outfitting store, a rooming house, and a farm in Mattapoisett, was also heavily invested in the whaling industry.